Italian fashion house Blumarine will launch Dange-Rose, a new fragrance for women, in October. Notes for the woody floral aromatic include basil, pink pepper, Nashi pear, magnolia, freesia, rose, cashmere, patchouli and amber. 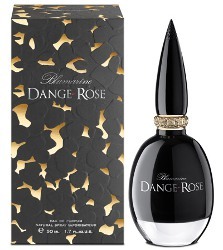 Blumarine Dange-Rose will be available in 30, 50 and 100 ml Eau de Parfum. HA, I spend full minutes. Many of them. I read it as Dang Rose and thought, huh, interesting. I think that’s how everyone will read it, at least, in English. This is not a bad perfume name! I’m fully caffeinated and did the same thing! And I thought it was Dance Rose. At first I read Dang. Then I read it out loud and it clicked. And I felt stupid. But seeing i am not the only one i think the marketing people should feel stupid for approving this name.